Register Log In ECN Forum Forums Electrical Nostalgia Ever see anything like this? I am going to try to upload a picture. Let me know if they come out. Have you ever seen a receptacle like this? 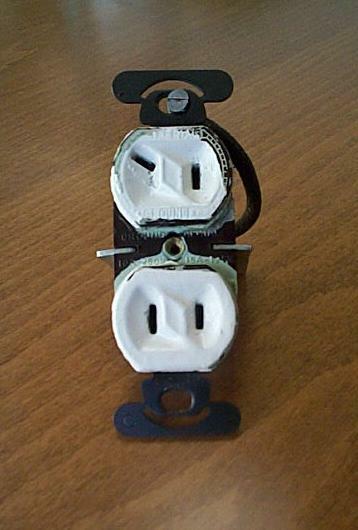 I have been doing electrical work for more than 25 years now and I never saw one of these. Any idea? I have my own idea, but I figured I would go to an expert. Wow!! Shouldnt this picture be in the international forum? I think this is an old TV/radio outlet, from the pre-cable days when almost every home had an antenna on the roof. 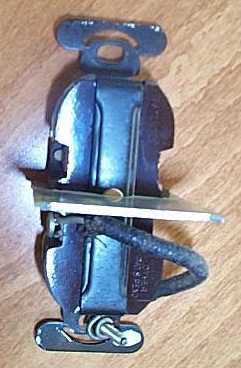 The bottom half is a standard 120 VAC outlet to power the set, and the upper half was connected to the 300 ohm twin lead from the roof mounted antenna. The antenna wire from the set was fitted with the strange mating plug. The box divider was to separate the LV and HV wiring inside the box. Do we know where this receptacle came from? Harold, can you shed some light on this?? My ex-foreman Jim found this receptacle while he was doing work in an old house. We both believe that the upper recepatcle has to do with an antenna. The word aerial appear on the receptacle. Mr. Hixson confirms (confidently) that is indeed for an aerial and 120V source for a radio or TV. Look closely at the upper plug--isn't it molded/labeled 'aerial' and 'ground'? I believe that Arrow-Hart was one producer of these. It was once common to have external connections on AM radios for a 'longwire' [outdoor/attic] antenna & 'whatever-was-handy' ground.